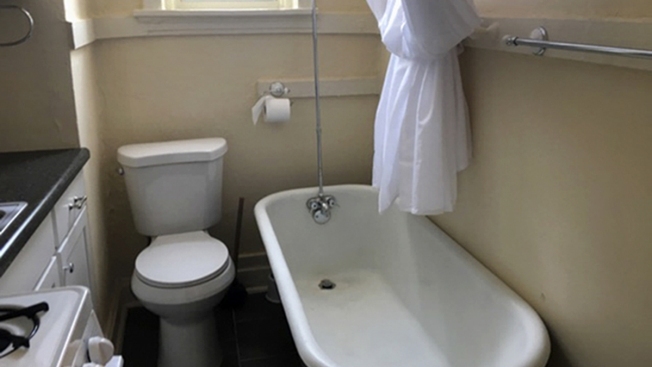 This photo from a rental ad provided by S.F. Shannon Real Estate Management LLC shows a toilet and bathtub in the kitchen of a 200-square-foot apartment in St. Louis. The toilet, bathtub, oven and sink all share a room. A St. Louis man is the new tenant of the tiny apartment. A St. Louis man is the new tenant of a tiny apartment with a unique layout — the kitchen and bathroom are in the same place. Yep. The toilet, bathtub, oven and sink are all in one room. The 200-square-foot (18.5-sq. meter) apartment is in St. Louis' tony Central West End. The ad and photo for the $525-per-month apartment appeared on several websites and had people flush with excitement. Harold Karabell of S.F. Shannon Real Estate Management says the new tenant loves it. The 111-year-old building originally housed 12 luxury apartments. Karabell says that around the time of the Great Depression, it was remade into 50 small units, the studio the smallest among them. Toilet/kitchen combo aside, Karabell says the apartment has a lot to like, including refinished hardwood floors and new windows.